Sugary drinks, or sugar sweetened beverages, include all non-alcoholic water based beverages with added sugar such as non-diet soft drinks, energy drinks, fruit drinks, sports drinks and cordial. Sugar sweetened beverages are high in kilojoules, leading to weight gain and obesity. Obesity is a leading risk factor for type 2 diabetes, cardiovascular disease and some cancers (including endometrial, oesophageal, renal, gallbladder, bowel and postmenopausal breast cancers). Sugar sweetened beverages produce more acid when the sugar combines with bacteria in the mouth. Try drinking water instead – it has no acid, no sugar, no kiljoules and if you get it from the tap it's free. Apovian CM. Sugar-sweetened soft drinks, obesity, and type 2 diabetes. Journal of the American Medical Assocation 2004; 292(8): 978–9. Mortensen A. 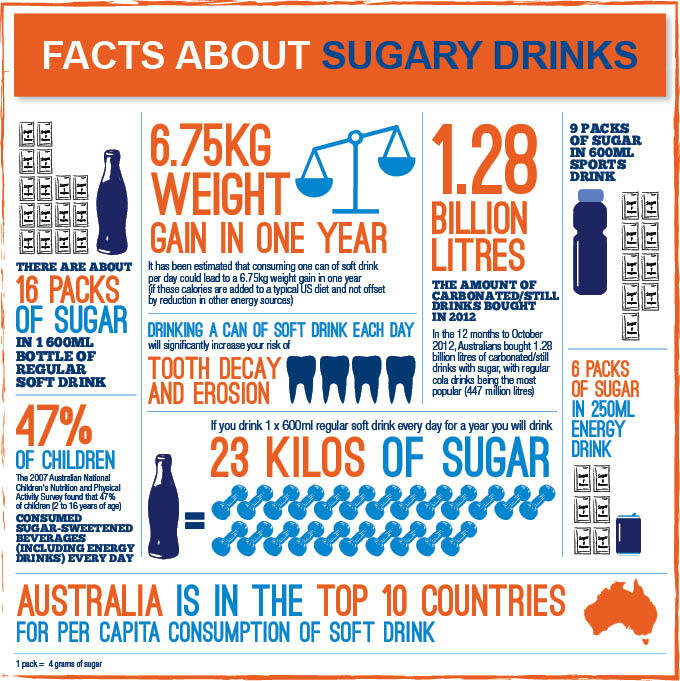 The role of beverages in the diet of Australian children. Analysis and summary report commissioned by the Australian Beverages Council. Australia, 2010: 1–15. Clifton PM, Chan L, Moss CL, Miller MD, Cobiac L. Beverage intake and obesity in Australian children. Nutr Metab (Lond) 2011; 8: 87. Walsh LJ. Black Cola drinks, oral health and general health: an evidence-based approach. ADA News Bulletin, 2008.